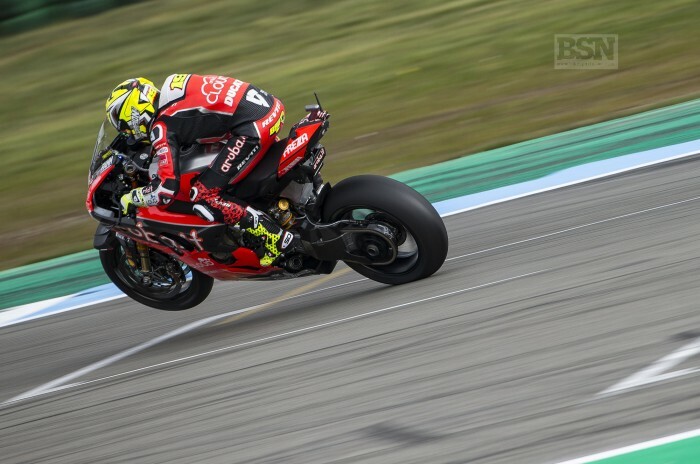 Alvaro Bautista today silenced the naysayers who believed he was only capable of winning on big-straight tracks by taking a three-second victory in the opening WorldSBK race at Assen today. The Spaniard made it ten wins in a row on the Panigale V4R with reigning champion Jonathan Rea fighting his way through from the middle of the grid for second place with local hero Michael van der Mark in third place. Alex Lowes (Pata Yamaha WorldSBK Team) and Leon Haslam (Kawasaki Racing Team) had a fight for the second half of the contest, with Lowes winning out in fourth place, Haslam fifth after his front tyre gave up. Markus Reiterberger (BMW Motorrad WorldSBK Team) had a great ride, in second place for many of the early laps, but one-by-one the more regular podium challengers passed him as his lap times completely dropped off. He was sixth in the end, 15 seconds back after 21 laps. Chaz Davies (Aruba Ducati) was seventh on his own, while a three-rider fight for the last places in the top ten went to Jordi Torres (Pedercini Kawasaki), if only narrowly, from Toprak Razgatlioglu (Turkish Puccetti Racing) and Tom Sykes (BMW Motorrad) tenth. Leon Camier (Moriwaki Honda) was a stronger 11th, relative to some recent results.